TS Polycet 2019 application form will be accessible from the second week of March 2019. State Board of Technical Education and Training (SBTET), Hyderabad conducts this entrance test for admission to diploma programmes in government, aided, Private unaided polytechnics and Private unaided Engineering Colleges. Candidates seeking admission in engineering/non-engineering diploma courses can apply to this test. 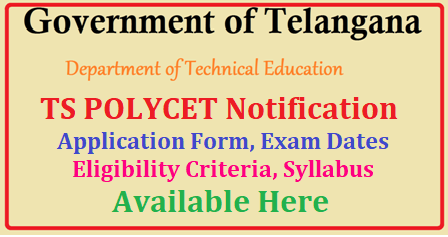 This article contains detailed information about TS Polycet Application Form 2019.